For years, we had planned to add steeples and a bell tower to our church in Vladivostok. We knew it would be quite some time before that dream was realized. But it first began to take shape in 1997. In August of that year, Fr. Myron met Fr. Edmund Cizak of Poland, the president of the Siberian Society of Poland. The Society exists today in many of the countries to which Poles fled during the Communist rule of Siberia. Fr. Myron and Fr. Cizak were both in Novosibirsk on August 10, 1997 for the dedication of the Catholic cathedral there. 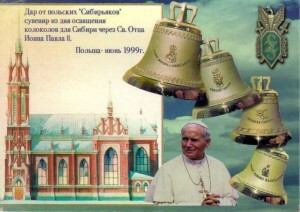 Postcard created to commemorate the creation and blessing of the bells. Fr. Cizak had brought bells for the new cathedral. They had been struck in Poland and the Society had covered all the necessary expenses. Fr. Myron immediately asked if he could have similar bells made for the church in Vladivostok. Shortly afterward, Fr. Cizak contacted Fr. Myron to discuss the design and materials for the bells. After some discussion, the design was completed for 4 large bells and they were created in a beautiful golden color. Furthermore, when Pope John Paul II was in Poland in 1999, he personally blessed them. Poland is about 6,500 miles from Vladivostok, so it would be a monumental task to transport them. We proposed a sea or Trans-Siberian Railroad route, but Fr. Cizak wanted to send them by truck. However, there aren’t roads the whole distance, unless the route went through China. Then Fr. Cizak heard about a group of Polish Boy Scouts who dealt with difficult trips to various parts of the world. They were already planning to drive to Magadan, Russia, far to our north. Fr. Cizak persuaded them to drive to Vladivostok with our bells. The scouts loaded the bells onto a truck and headed for the Ukraine. But at the Russian border, they encountered Russian Customs agents who wanted $1,500 of duty for the bells and truck. Naturally our scouts asked us what to do. We sent them $1,500 and also sent a letter to Russian Customs in Moscow asking that they admit the bells without duty, since they were not for sale. Plus, they would be used in the renovation of the historic architectural monument in Vladivostok, the Cathedral of the Most Holy Mother of God. The scouts proceeded to the Ukraine, then across Siberia to Chita. At that point, the truck began having mechanical problems and the roads became practically nonexistent. Bells are unloaded at their destination in Vladivostok in October 2000. They decided to leave the truck with the newly formed Catholic parish in Chita. They loaded the bells onto the train to Vladivostok and accompanied them all the way to their destination. 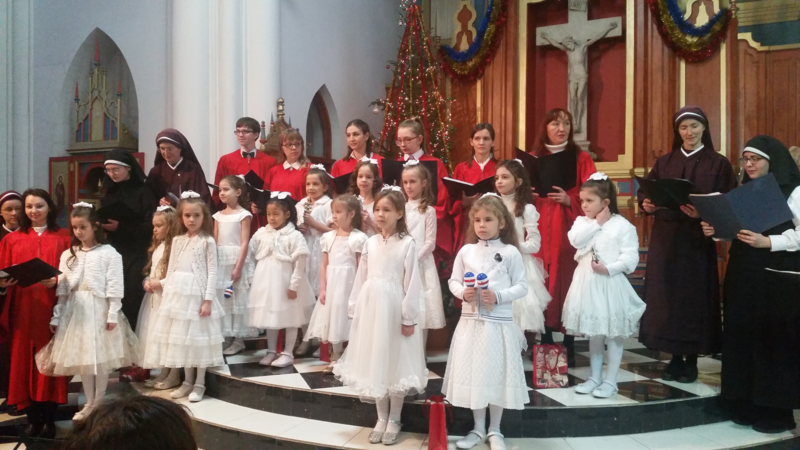 After spending some time in customs, the bells finally arrived at our church on October 12, 2000. For more than 9 years, the bells sat either in the church foyer or in storage as church renovation progressed. During that time, the architectural designs for the steeples and bell tower were finalized, the structures were built, and the church interior was completed. Finally, on March 21, 2010, the church was consecrated, the steeples were blessed, and the bells rang out for the first time. Further detail is provided in Issues No. 36 and 93 (November 1, 2000 and May 1, 2010) of the Vladivostok Sunrise newsletter.